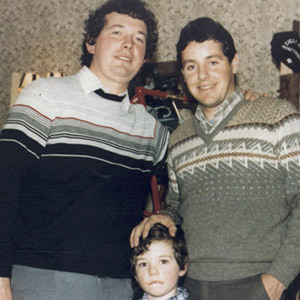 On Wednesday 13th May 2003, one of Northern Ireland's cycling greats was laid to rest. Tommy Smyth (82) from Bellaghy was mourned throughout the country. 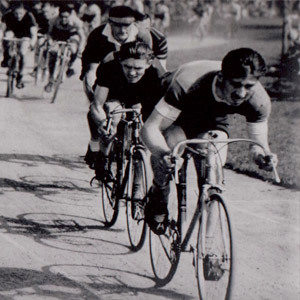 His legacy within cycling extends back some 70 years. A member of Kings Moss between 1939 and 1955, he gained many club successes. His undisputed golden-era extends though the 1953 to 1955 seasons when he gained Northern Irish and Irish 10, 25, 50, 100 mile and 12 hour honours. 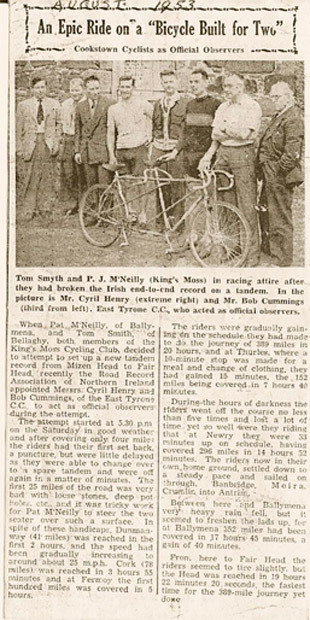 His most celebrated achievements however took place on a tandem, partnered by Paddy McNeilly. The pair set a variety of records including Belfast-Enniskillen, Belfast-Londonderry-Belfast and the most-famous of all; Mizen Head (Co. Cork) to Fair Head (Co. Antrim), covering 389 miles in 19h 23mins. He remained deeply involved in cycling long after retiring from competition. 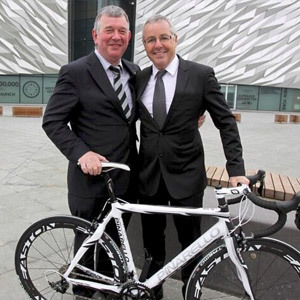 He was both respected and renouned for active support of NI cycling. This culminated in becoming vice-president of Ballymena Road Club and lending his name to the Tommy Smyth Cup. To us he personified all that's good in Irish cycling. He loved friendly conversation, regardless of your credentials. From Sunday afternoon cyclists to prolific racers, Tommy always found a pleasant and encouraging word, expressed in his own unassuming way. 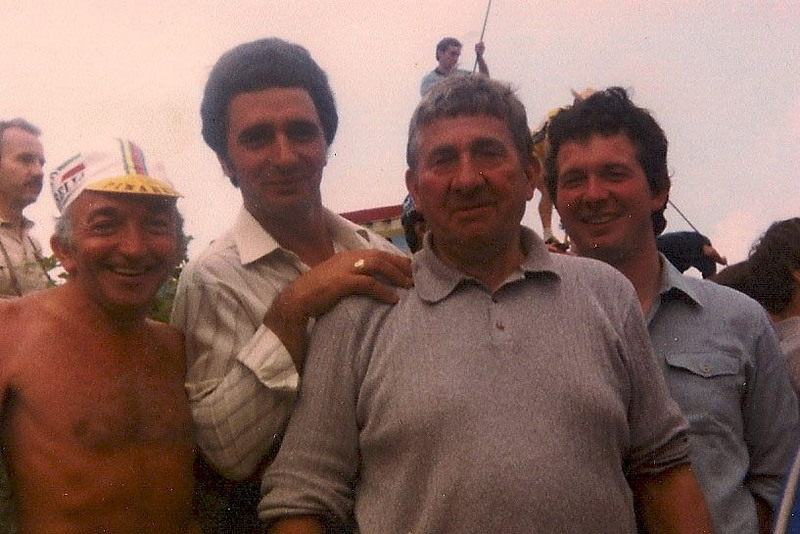 In the early 70s, inspired by my father's love of cycling I decided to open a bicycle shop in Moneymore. The shop was originally a 20 x 10 foot garden shed, given to me by my father, located at the side of our house. We hadn't a lot of money & it was modestly stocked with Peugeot & Dawes bicycles & accessories. I had always wanted to sell exotic racing bikes so I travelled with my father & Marino Fresch, a Venetian & fluent Italian & English speaker to Italy in 1976. We visited many manufactures but decided to import Pinarello bicycles from Treviso, which we successfully sold for the next fifteen years. When in Italy I noticed all the bike shops & manufactures were named Cicli followed by the owner's surname, e.g. Cicli Pinarello so when we returned home I adopted the idea & the shop name Cicli Sport was born. 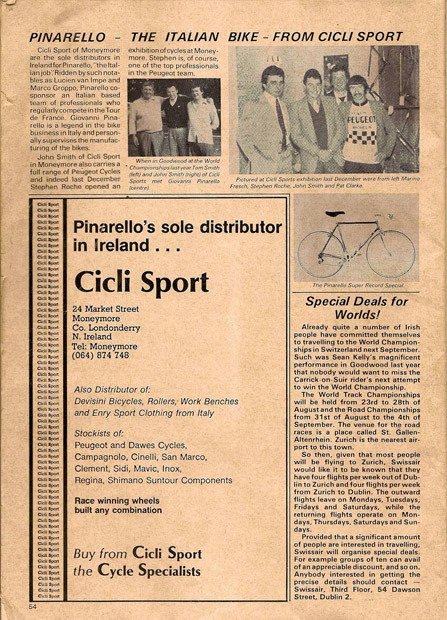 In the winter of 1982 we held our first Cicli Sport show introducing Pinarello & other exotic Italian cycle parts & clothing to Ireland. 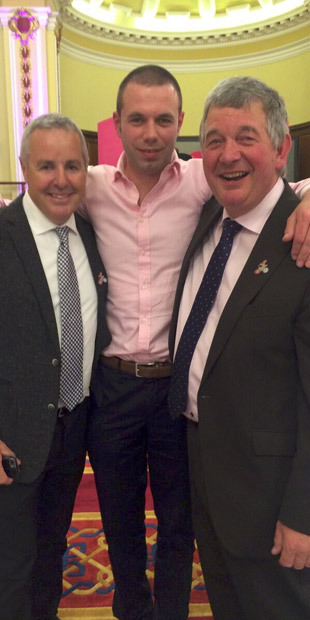 We needed a sporting celebrity to help promote the products we were importing, our first choice was the young cycling sensation Stephen Roche who attended the next four events. 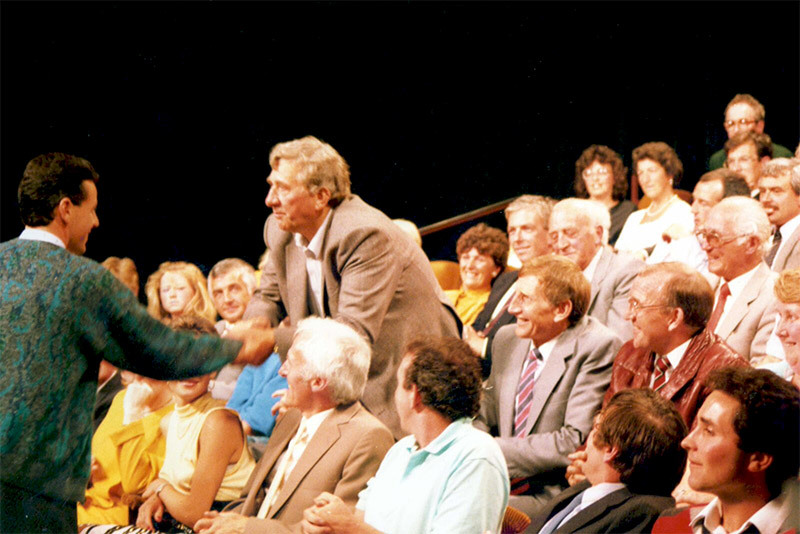 It was then we started our friendship with Stephen which has lasted to the present day. Over the coming years we expanded the shop on the original site replacing the wooden shed with a plain one room shop adjacent to the house. During these years we increased the range to include Pinarello, GT, Trek & Giant. In 1993 I retired from the civil service & began working full time in the shop, as the business grew I eventually employed my son Jonathan in 1997, who is now my partner in the business. With a deep history and passion for cycling, it's not surprising that almost 40 years ago Cicli Sport quickly established itself as one of Ireland's premier bicycle shops. My father and grandfather introduced high end Italian cycle equipment to Ireland and through the years Cicli Sport always remained associated with the leading brands in the cycle industry. 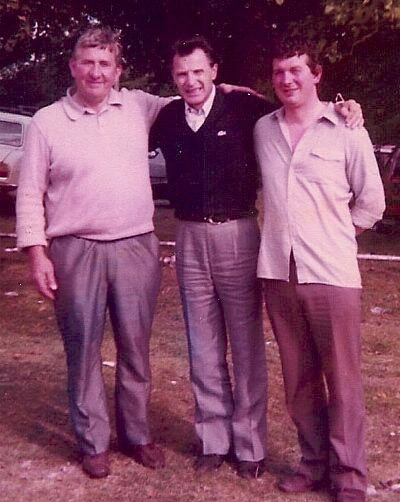 Our history is something we're extremely proud of but we wouldn't be here if we only ever looked back, so as third generation of the Smyth family I hope to build on the success of my father and grandfather. In the late 90's we welcomed American cycling brand Specialized to our product line up. Specialized's attention to detail and commitment to research and development enables Cicli Sport to move forward, confident that we remain at the forefront of cycling retail. In 2003 we extended our premises incorporating the house we once lived in and the original Cicli Sport shop which effectively more than quadrupled our floor space. We followed this by building a new bike fit room in 2013 and welcomed my sister Julie to the business. With her she brings a degree in physiotherapy making her the ideal bike fitter and in 2015 we have introduced the Cicli Sport ecommerce web site. We pride ourselves in ensuring that we provide a high level of customer service that is on a par with the quality of product we sell.This personal service and attention to detail are what we feel is at the heart of our family run business and we're look forward to writing the next episode in the history of Cicli Sport and celebrating another 40 years in the cycle industry.